All Inclusive Food : Breakfast,Lunch,Dinner,5 o'clock tea and cakes. Nonalcoholic drinks : Coffee, Tea, coke, fanta, lemonade, juice, soda water bottle water (only between 10:00-and 22:00 ). (08:00-09:00 – 13:00-14:00 – 18:00-20:00 - 22:00-00:00). 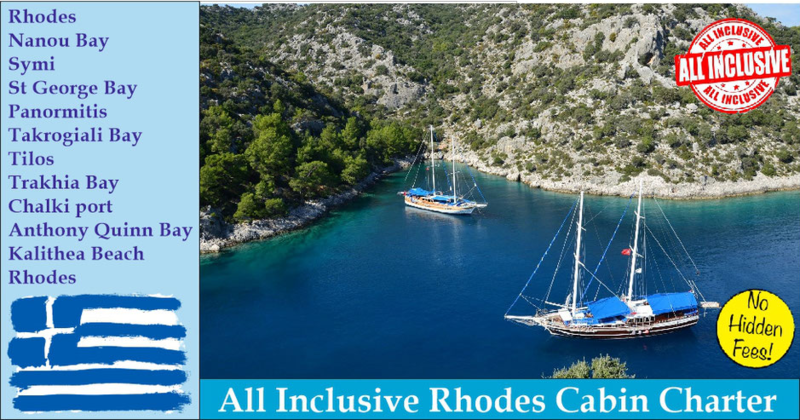 Boat A/C – Traditional Wooden Gulet (M/S) - Air conditioning (08:00-09:00 – 13:00-14:00 – 18:00-20:00 - 22:00-00:00). Embarkation Time By 16:00 p.m. Optional Excursions You will be advised by the guide according to your liking. Afterwards, around 16:00, we cruise to Symi port. Please have your camera ready for wonderful images of this small fairy-tale like Greek village. Your dinner will be served on board, but if you wish to dine ashore by yourselves, please inform the captain in advance. All of the traverna’s on Symi are very tempting and the captain will understand your choice. Today, we leave from Symi port after breakfast between 09:00-10:00. We will stop for lunch, swimming and relaxing in one of the beautiful bays around the island, at St George bay or one of the many other bays. After this, around 16:00, we will cruise towards Panormitis, located in the southern part of Symi. You can visit the Monastery of the Archangel Michael Panormitis. This is a Greek Orthodox monastery built in the early 18th century, and still inhabited by monks. It is visited by people from all over the world, and many Greeks pay homage to St Michael of Panormitis each year. (Loud) Music is not allowed here. If the sea conditions are not optimal, we might have to cancel Panormitis and go to Pedi instead. We cruise towards Tilos after breakfast today, between 09:00-10:00. Tilos is surrounded by high and rocky mountains, steep coasts, beaches with transparent waters and caves. We will enjoy the day at Takrogiali Bay. Late afternoon, around 16:00, we will enter Tilos harbor so that you can stretch your legs again and walk around the little town. In the centre of the island, there is an abandoned village on the top called Mikro Chorio (reachable by taxi or bus). You can also go there in the evening to have a drink in the bar.Dinner and overnight. Today, between 09:00-10:00, we make our way back to the New Marina in Rhodes. Dinner and overnight in Rhodes New Marina. Cruise itineraries are given as a general guidance only. Tours are subject to change, due to bad weather/sea conditions, force measure and change in local legislation without prior notice and docking conditions in major ports and marinas. Certain stops might be visited on another day than shown in the above program or might be cancelled. Your Captain is responsible for all passengers and crew on board, and he has the right to change the program if needed. Please note that Sunday night is spent in Rhodes New Marina and on Monday morning, your captain and the Medsail Holidays staff will organize all necessary formalities and/or fuel. We will start cruising between 10:00-13:00, depending on how busy it is at the port authorities and/or fuel office. Saturday morning 09:00-10:00 we arrive back at Rhodes port for a free day and last night on the boat. If you would like to visit the Old Town or any of the beaches or villages on Rhodes Island, you can request for a taxi at the reception which is located at the entrance of the New Marina. Walking to the Old Town is about 20 minutes. INCLUDED: Accommodation on the gullet, crew, fuel, harbor fees, transit log, cleaning, service, use standard yacht equipment. Meals are included (breakfast, lunch, 5 o'clock tea, dinner and water during meals). Non alcoholic drinks (coke, lemonade, juice, soda water and bottled water 10:00-22:00). Alcoholic drinks (ouzo, wine, beer 12:00-22:00). Drinks are served by the crew only, per glass, not by the bottle. Clients are welcome to bring their own drinks on board. Please note that the Captain might decide to stop serving alcohol early, for health and safety reasons.